“I am watching one of the greatest movies ever made.” It’s a thought I’ve had many times before, but only when revisiting old favorites, or having my first belated look at a decades-old classic. No matter how obviously magnificent a contemporary film may be, I’m not generally prepared to reserve a place for it in the canon before it’s even halfway over—indeed, it often takes me two or three complete viewings before I finally make the leap from “just plain great” to “all-time masterpiece.” I’m slow that way. Call it We Need to Talk About Existence. Like Lynne Ramsay, however, Malick can’t maintain that level of poetic abstraction forever. (Actually, I believe they both could have, but neither apparently wanted to.) After bopping freely across time and space for over an hour, The Tree of Life finally settles down and starts telling something like a straightforward story, as the couple’s eldest son, Jack (Hunter McCracken), repeatedly squares off against Pitt’s crew-cut martinet. (At various points, though not in this lengthy section, we also see Jack as a world-weary adult, played by Sean Penn.) Given what we know about Malick—born and raised in Waco, with a brother who died young (as one of Jack’s brothers apparently does, though that occurs during the impressionistic blitz)—this material is likely autobiographical, and it’s certainly deeply felt; many individual moments of random beauty and violence still stand out. But the longer the film goes on, and the more its figures solidify into actual characters, the less magical it seems, until eventually it resembles a solid but largely unexceptional memoir not unlike, say, This Boy’s Life. (Remember that one? With De Niro and DiCaprio in the Pitt and McCracken roles?) 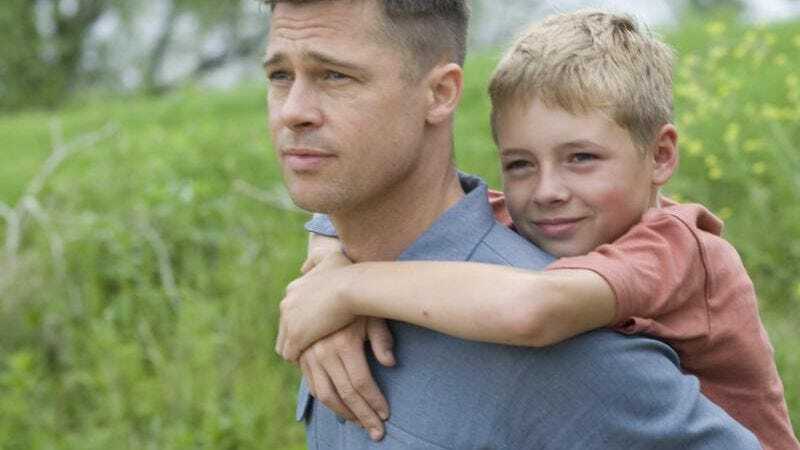 Maybe that first hour raised my expectations so high that no second hour-plus could possibly fulfill them, but my gut feeling is that Malick got distracted from his overall conception by a desire to revisit specific incidents from his childhood, by the need to depict his father rather than simply a father. And the film’s denouement, which attempts to circle back to transcendence, felt disappointingly banal, even a bit drippy. The Tree of Life is a major achievement, and I’d be perfectly happy to see it win the Palme d’Or (it’s my personal vote as of this writing, since Martha Marcy May Marlene and Miss Bala aren’t in Competition), but the space I’d cleared for it in my list of the five or ten greatest movies ever made remains empty. Wholly Inadequate Grade: B (but I can readily imagine it graduating to a B+ on second viewing). Tomorrow: Aki Kaurismäki returns after a five-year absence, and 2007 Grand Prix winner Naomi Kawase (The Mourning Forest) takes another shot at the Palme.